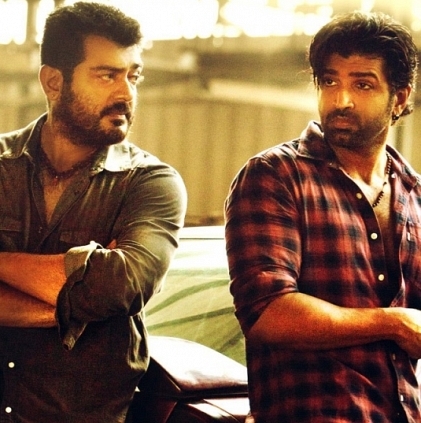 Arun Vijay gave the role of a baddie a different dimension in the Gautham Menon directorial Ajith starrer Yennai Arindhaal. His character as Victor in the film brought him lots of plaudits and fans. Impressed by his work, director Srinu Vaitla has roped him in his upcoming Telugu film where Ram Charan Teja plays the lead. Talking about this project to behindwoods, Arun states, “Yes, it is true that I play a role in Vaitla sir’s film which has negative shades. I liked the script and my character in the film. I have completed twelve days of shoot and will start again around this month-end. I am very happy working with the team as most of them are known to me. My look will be uber stylish in the film”. GV Prakash is on a roll ... signs yet another ..
Suriya to join hands with a blockbuster director in 2016? 5 days ... 200 plus crores ... Baahubali is massive !! Is this Rajini's NEXT look? Arun Vijay Clarifies About His Role In The Kannada Remake Of Ivan Veramathiri. Singer Baba Sehgal To Play The Main Bad Cop For STR And Gautham Menon's Acham Yenbathu Madamaiyada. People looking for online information on Arun Vijay, Gautham Menon, Ram Charan Teja, Srinu Vaitla will find this news story useful.